topeScope is a great little program. I build 3d architectural models in Vectorworks 12 on macs and export StL files to RPM manufacturers. With topeScope I am able to see geometry errors and fix them back in Vectorworks prior to having the models built. Your program is indispensable! 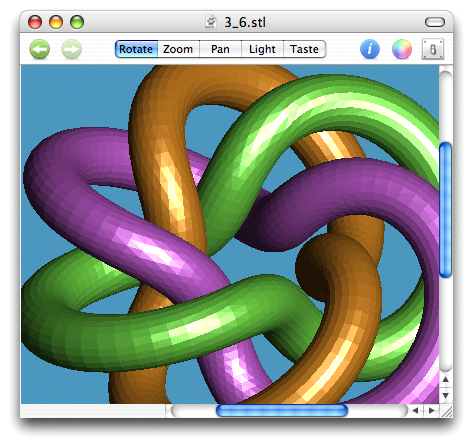 I use topeScope for viewing STL files for rapid prototyping and for rendering images for presentations. The program is extremely easy to use. It is very useful for quickly getting feedback on designs before making parts and for checking designs from CAD. I work in the rapid prototyping/manufacturing area making ceramic parts. Download topeScope now and give it a try. In demo mode, topeScope is a free STL viewer. Even if you only use the viewer feature, please support the development of topeScope by purchasing a license. Place a credit card order using the secure online store. Copyright © 2006-2019 Ripplon Software Inc.